To register as a nairabox Merchant, click on "Sign Up", fill the form, enter your CAC Registration Number and upload your company's logo. Click on "Register" when you are done. An email containing your "Merchant ID" and all relevant information will be sent to you via your registered email within 24 hours. 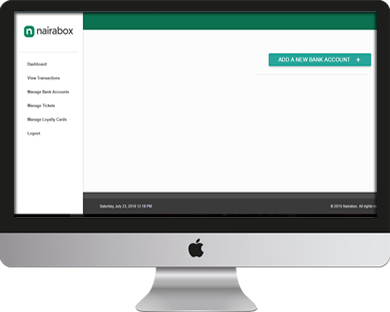 As a nairabox Merchant, a bank account will be needed where you can receive your funds. 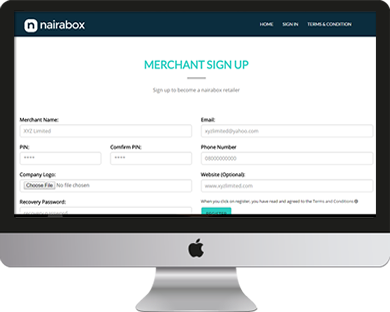 When you receive your Merchant ID, visit the nairabox merchant website where you registered as a merchant. Click on "Sign in", enter your Merchant ID and your PIN, and click on "Log In". Now you have access to your portal where you can see your transactions. Click on "Manage Bank" and then click on "Add a new bank account". 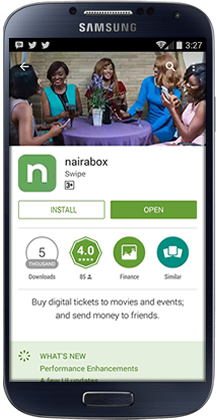 Fill the form that pops up and click on OK.
Get a mobile device running on android (from version 4.4 KitKat, a back camera quality of at least 5MP and front camera quality of at least 2MP) or an IOS (Apple iphone) and download the nairabox app. Launch the app on the device, click on "Sign In". At the botton of the next page, click on the sign in for nairabox business. Enter your login details (which include: the Merchant ID, Merhant PIN, and and a Terminal ID) and tap on "Sign In". 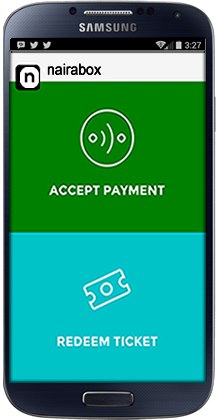 Your device is ready to accept paymet and/or scan digital ticket. nairabox is a trademark of JORG Technologies Limited. ©nairabox 2015.